Two Awesome Middle Grade Books You must Read! Hello everyone. I’m Lisa Orchard the author of the bestselling Super Spies series, and I’m here today to talk about a couple of books. One my son recommended to me, and one I discovered on my own. After reading both of them, I thought they’d be perfect for the Emblazon Blog. 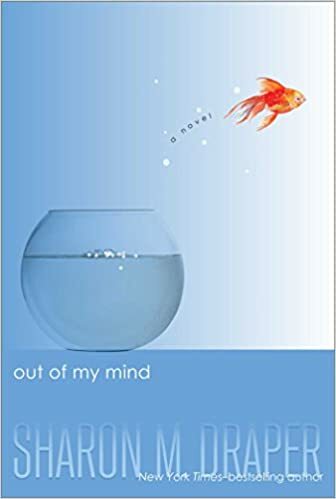 The title of the books are “Out of my Mind” and “The Thing about Jellyfish.” The cover and blurb for “Out of my Mind” are below. Eleven-year-old Melody has a photographic memory. Her head is like a video camera that is always recording. Always. And there’s no delete button. She’s the smartest kid in her whole school—but no one knows it. Most people—her teachers and doctors included—don’t think she’s capable of learning, and up until recently her school days consisted of listening to the same preschool-level alphabet lessons again and again and again. If only she could speak up, if only she could tell people what she thinks and knows . . . but she can’t, because Melody can’t talk. She can’t walk. She can’t write. Being stuck inside her head is making Melody go out of her mind—that is, until she discovers something that will allow her to speak for the first time ever. At last Melody has a voice . . . but not everyone around her is ready to hear it.From multiple Coretta Scott King Award winner Sharon M. Draper comes a story full of heartache and hope. Get ready to meet a girl whose voice you’ll never, ever forget. I absolutely loved this story. It was heart wrenchingly honest and triumphant. I loved Melody. She has cerebral palsy and is literally trapped in her own mind. She can hardly communicate until she gets a Medi-Talker, that’s when everyone finds out how smart Melody is. It’s a story that illustrates how dangerous labels can be. I loved Melody’s fighting spirit and this book has made me more aware of the fact, that just because someone can’t communicate the way you and I do, doesn’t mean they’re not intelligent. If you’re looking for a book that’ll teach your middle-grader tolerance and acceptance of differences. This book is for you. It’s also a book that teaches perseverance. Melody didn’t give up. Even when there were tremendous obstacles in front of her, she stuck to her guns. I wish all kids had her fighting spirit. I also loved Melody’s support system. Her parents were wonderful, and Mrs. V. was a true guiding light in this story. Wouldn’t it be nice if all kids had that kind of support? I’m sure the world would be a better place because of it. I highly recommend this story, especially for reluctant readers, because of the message in it. It might help them persevere as they struggle with their reading. It might help them realize everyone has struggles to contend with. One person’s might be cerebral palsy, another’s might be reading, and another’s might be math. 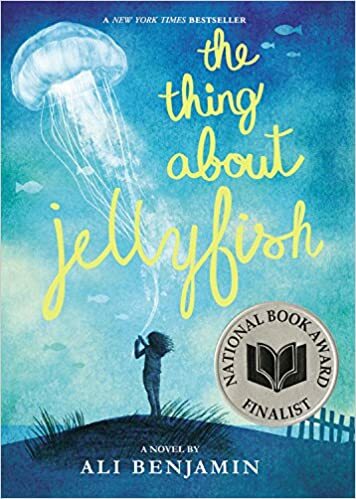 The second book I’d like to recommend is “The thing about Jellyfish.” The cover and blurb are below, and it’s an amazing story about how a young girl deals with the loss of her best friend. I absolutely loved Suzy in this story. I loved her strength and her absolute conviction that a Jellyfish stung her best friend. She was not going to accept that things just happen. After her best friend dies in a drowning accident, Suzy is convinced that the true cause of the tragedy must have been a rare jellyfish sting-things don’t just happen for no reason. Retreating into a silent world of imagination, she crafts a plan to prove her theory–even if it means traveling the globe, alone. Suzy’s achingly heartfelt journey explores life, death, the astonishing wonder of the universe…and the potential for love and hope right next door. This was an amazing read. I absolutely loved it. It tells the tale of a young girl trying to make sense of the loss of her friend who drowned. Franny, her friend, was a strong swimmer and Suzanne, the main character, believes Franny must have been stung by a jellyfish. That’s the only thing that makes sense to her. So, she decides to prove her theory. The author tells a tale of a young girl coping with the loss of her friend by trying to find a rational reason. One thing I loved about this story is the science the author weaved into the tale. Her knowledge of the jellyfish species is vast, and she shares it with the reader in a way that keeps your interest. She also does this without losing sight of Suzanne’s story. I’d highly recommend this to teachers and librarians. There’s a lot of knowledge in this story the reader will pick up, and it may even spark an interest in science. Isn’t that what all good books do, spark interest in a subject? Another reason I love this story is because it introduces the reader to the loss of a friend, and explains that sometimes there is no rational reason for a tragedy. Things do “just happen.” This story is a great way to show your child sometimes we can’t find all the answers and we have to accept it. Thanks for stopping by and checking out my book recommendations. I love reading and writing for kids, so I’m always looking for a great story. If you have any recommendations you’d like to share, please leave a comment! I’d love to hear from you! Lisa Orchard grew up loving books. She was hooked on books by the fifth grade and even wrote a few of her own. She knew she wanted to be a writer even then. Her first published works are the “Super Spies Series.” These stories revolve around a group of friends who form their own detective squad and the cases they solve. “The Starlight Chronicles,” is the next series Lisa created with musical misfit, Lark Singer as her main character.